Looking down on Scotty's Castle in Death Valley National Park. This view is looking eastward up Grapevine Canyon. A spring in the Canyon provides water for the Castle and creates the oasis. Our small RV Quivera is peeking out on the far right. Walter E. Scott was a scoundrel and a showman, a master at bilking rich people out of their money. He was born in Cynthiana, Kentucky in 1872. I may be related. My Great, Great, Great, Great, Great Grandfather, Andrew Mekemson/Makemson is buried five miles from town. For a time, in the late 1700s and early 1800s, our whole Scotch-Irish clan lived in the area. At one point, Makemsons and Scotts in Harrison County intermarried. Possibly it was with Scott’s family. Walter didn’t hang out in Cynthiana for long, however. In 1883, at the age of eleven, he split. Some say he ran away. He ended up working as a cowboy with his brother in Nevada. He must have looked great on a horse. A talent scout for Buffalo Bill’s Wild West Show recruited him as a cowboy and trick rider when he was 18. For the next 12 years he toured the US and Europe along with such luminaries as Annie Oakley. In 1902 he discovered his true calling. Walter started selling shares to an incredibly rich gold mine in Death Valley, a gold mine he never quite got around to finding. He became the star of his own Wild West act. Reinvesting his investors’ money, he travelled from LA to New York City, stayed at the best hotels, spent lavishly, and constantly promoted his non-existent gold mine. Reporters were attracted to him like buzzards to road kill. And why not… they were guaranteed a great story, free meal and all the booze they could consume. The legend of Death Valley Scotty was born. Rich men lined up to contribute. In 1905 he pulled off one of his most successful self-promotions. Scotty hired a three-car Santa Fe railroad train to make a record run from Los Angeles to Chicago. The ‘Coyote Special’ made the trip in 44 hours and 54 minutes. His pot of gold was waiting. Albert Johnson lived in Chicago and was Scotty’s opposite. While Scotty was a flamboyant con man and adventurer, Albert was a quiet, highly educated and deeply religious man… not to mention very wealthy. He became excited about the gold mine. Scotty had found his meal ticket for life. Eventually Albert visited Death Valley to see the mine. Or possibly he came out to see why there were no returns on his investment. Scotty saddled up and took him on a strenuous wild goose chase through the desert. It was risky. Albert was not a healthy man and the trip could have killed him. The opposite happened. His health improved and he came to love Death Valley. What was even more surprising, he developed a close friendship with Scotty and that friendship was more important than the gold. Time and again Albert returned to Death Valley. 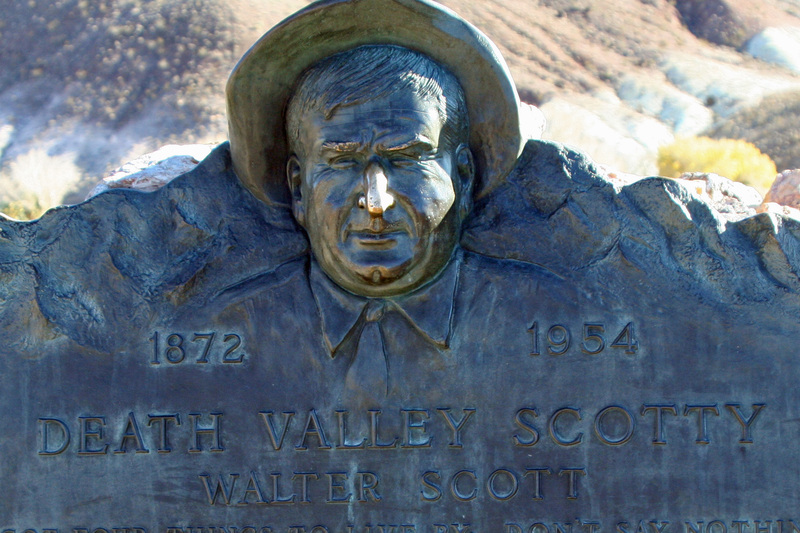 He started bringing his wife Bessie along and she also developed a love for Death Valley and Scotty. But she didn’t like sleeping on the ground. So Albert offered to build her a castle, which he did. It was an incredible feat given the vacation home’s remote location on the northern edge of Death Valley in Grapevine Canyon. Starting in the Roaring 20s and ending in the Great Depression, it cost two million dollars and took five years to complete. Any respectable castle requires a turret. Scotty promptly moved in: not as a guest, not as a renter and not even as a caretaker, but as the owner. He claimed it was his castle built with money from his gold mine. 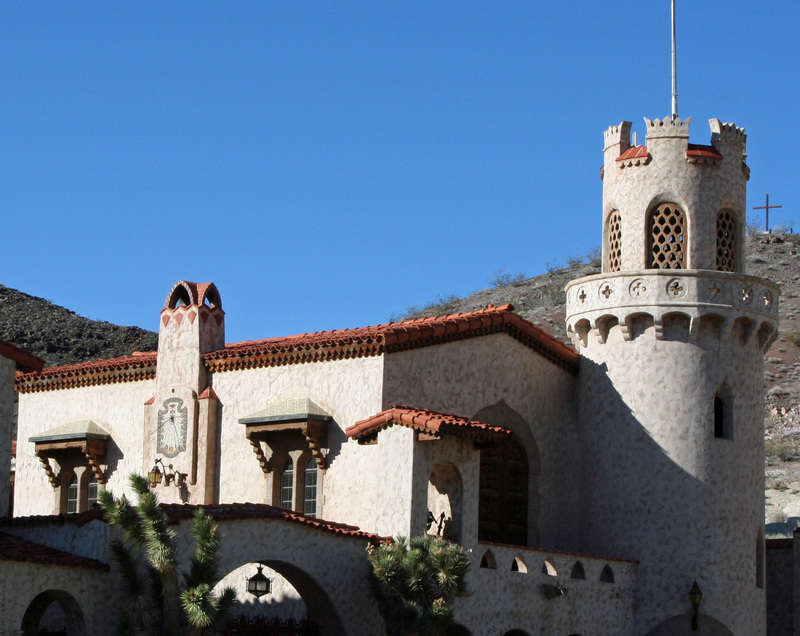 Albert and Bessie went along with their friend’s deception and Besse’s home became know as Scotty’s Castle. Albert died in the 1940s and left the property to the Gospel Foundation, a charitable organization. But he left it to the charity with a proviso: they had to take care of Scotty, which they did up until his death in 1954. 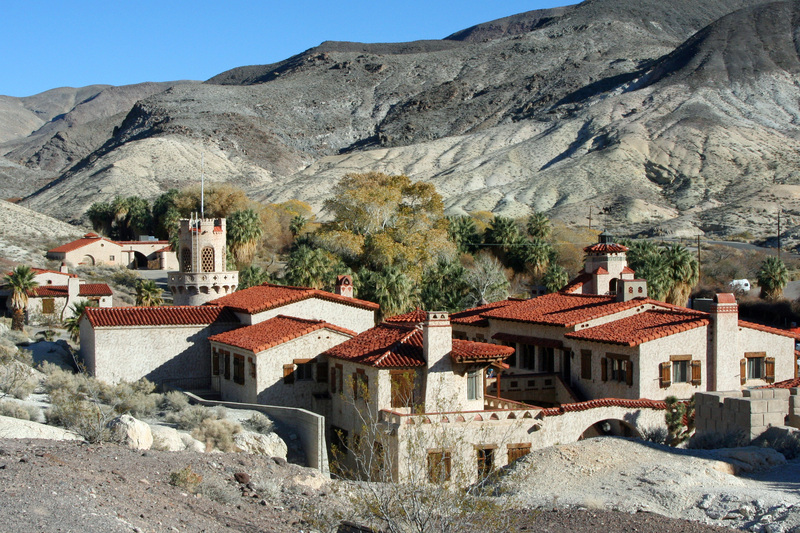 In 1970 the National Park Service bought Scotty’s Castle from the Gospel Foundation and today’s visitors to Death Valley are welcome to include this beautiful and unique property as part of their adventure. A short walk up the hill behind the castle takes visitors to Scotty’s grave and a great view of the castle. This blog marks the start of my National Park Series. Beginning in 2000, my wife Peggy and I have visited all of the US’s National Parks. From time to time I will feature our favorites. Over the next two weeks I will be blogging on Death Valley and the surrounding region. 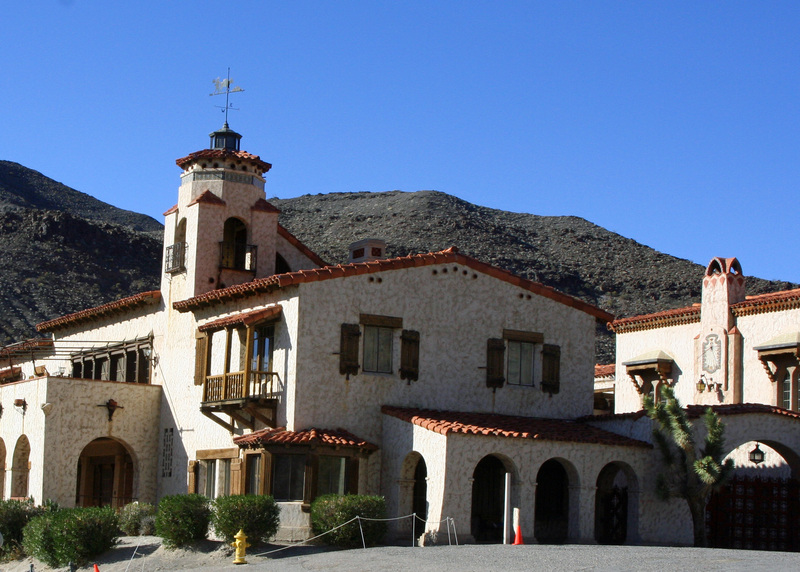 Another view of Scotty's Castle in Death Valley. Note the weather vane on top. 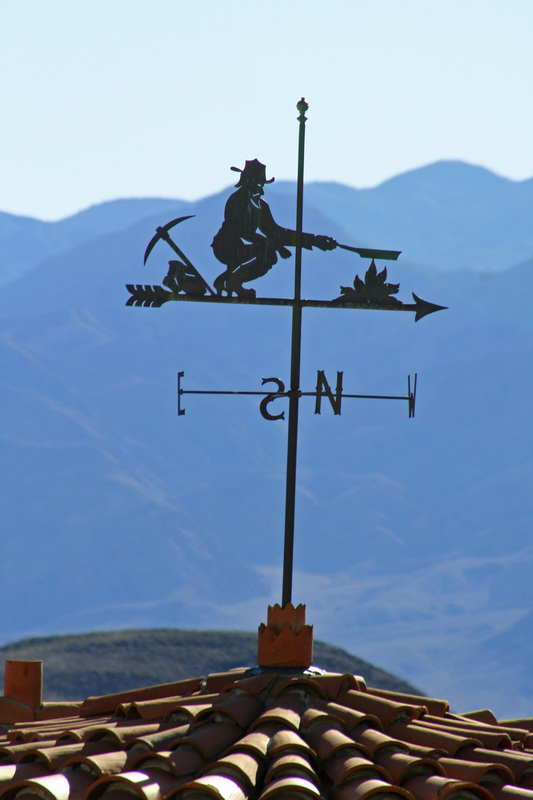 A close-up of the weather vane and my favorite photo of Scotty's Castle. To me, it symbolizes the lonely prospector of the West. All that's missing is a donkey or horse. A short walk up behind Scotty's Castle will bring you to Death Valley Scotty's grave and memorial. The site also provides a great view of the Castle and surrounding desert. 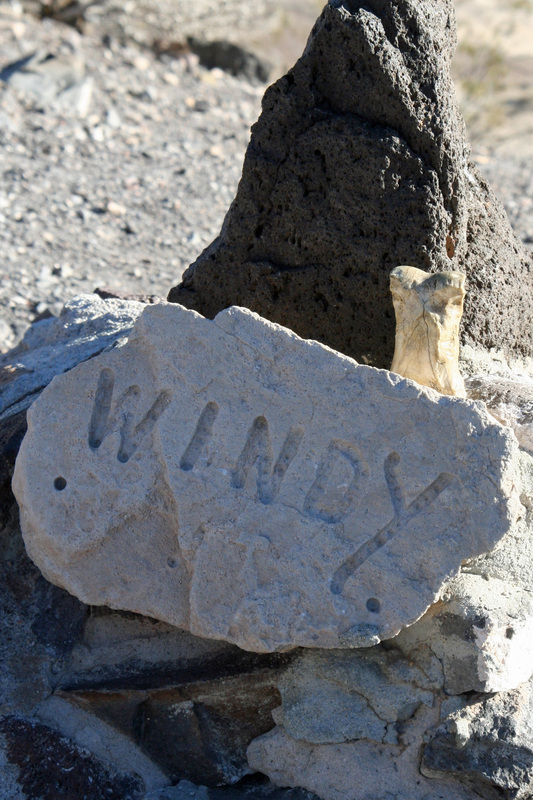 Scotty's faithful companion, Windy the Dog, is buried beside him. Bone, as in the Peripatetic Bone, stops by for a visit. Bone has been traveling the world for 36 years and has a special place in his heart for graves. No surprise there. He is more careful around live dogs. 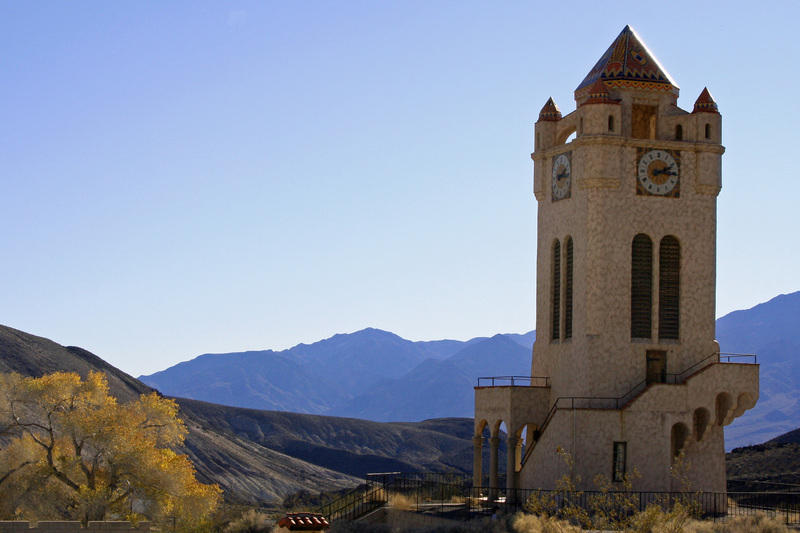 A view of the Clock Tower at Scotty's Castle looking out toward Death Valley National Park.